Pattern booklets, yarns and other must-have stuff. New books from Debbie Bliss and Louisa Harding, plus an update on a Mary Walker Phillips classic. Using up those coveted Noro yarn leftovers. Eleven different edging techniques that bring out Noro yarns' best features. Textured accessories pop in two key shades of the season. 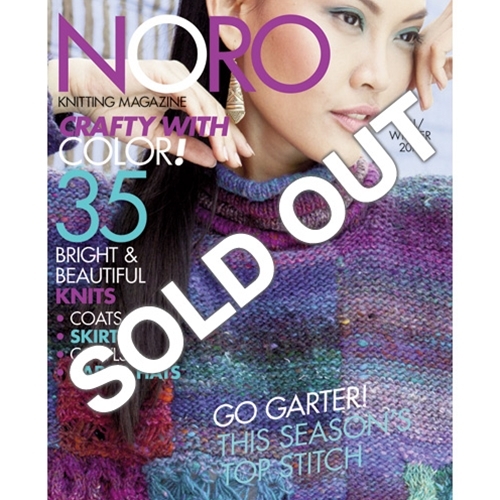 Perfect together, Noro's striking striping and garter stitch. Noro colors come on strong—in the best possible way. Knitted outerwear in bold bubblegum palettes. Knitted skirts add panache to a workaday wardrobe. Crocheted wraps in muted tones hark back to a golden age. Striped and solid shades used in harmony intensify beautiful coverlets.